Master Anna Oulashin began her Soo Bahk Do training in 1982 in Honolulu, Hawaii under Master Robert M. Shipley III. In 1985 she left Hawaii for Seattle, Washington. There she trained with a non-federated Tang Soo Do school for three years attaining the ‘black belt rank’. In 1988 she found a U.S. Soo Bahk Do Moo Duk Kwan Federation studio in Mt. Vernon, Washington. She relinquished her black belt rank from the previous school and began her training again, as a red belt, 1st gup, a few steps back. Her job required her to move to Portland, Oregon in 1990. It was there that she reunited with her original instructor, Master Shipley, and resumed her training in Camas, Washington. In June 2000, she traveled to Carbondale, Colorado for 2000 Ko Dan Ja Shim Sa. She successfully passed the 4th Dan evaluation. In January 2005, she successfully passed her 5th Dan evaluation at the 2005 Ko Dan Ja Shim Sa in Ramona, California. Ms. Oulashin is a Sa Bom (certified master instructor by the U.S. Soo Bahk Do Moo Duk Kwan Federation). 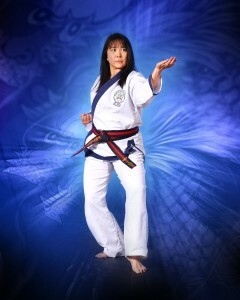 She has also participated in several high-profile martial arts competitions in Washington state. In July 2005, Master Oulashin placed 2nd Place in hyung in the O Dan Ko Dan Ja Division at the 27th USSBDMDK Nationals held in Orlando, Florida. She has attended every National competition since 2001 either as a competitor or ring judge. As Chief Instructor for Camas Karate she helps put together fund-raisers, tests, and website along with Smith Sa Bom Nim & Bagnall Jo Kyo Nim. Master Oulashin is the past secretary and treasurer of the Region 10 Dan Association. She previously served as Region 10 Administrator, coordinating the region’s Dan Shim Sa events and clinics as well as assisting the Regional Examiner in various administrative tasks. She currently maintains the Region 10 website. In 2009, Master Oulashin was appointed into the position of Region 10 Examiner by Kwan Jang Nim Hwang Kee. In August 2018, she was promoted to Chil Dan (7th level master instructor, similar to 7th degree “black belt”) after successful completion of the 8-day 2017 Ko Dan Ja Shim Sa in Texas. In addition, she has served the U.S. Soo Bahk Do Federation in various capacities including form development and editor of the 2009 Federation Member Manual. In 2010, she was selected as one of the founding members of the U.S. Soo Bahk Do Foundation, Inc. – a 501c3 – and selected as member of the Board of Directors and Treasurer. Life outside of Soo Bahk Do consists keeping balance in family and work. When she is not at work or teaching Soo Bahk Do she enjoys spending time with her family – bike riding, walking on the beach, reading, listening to Hawaiian music, cooking and making valiant attempts at gardening or just relaxing.